انصاری لاری, احمد, انصاری, مریم. (1397). برآورد میزان فرسایش خاک در دشت مرودشت (استان فارس) با استفاده از مدل تجربی RUSLE. پژوهشهای ژئومورفولوژی کمّی, 4(4), 134-149. احمد انصاری لاری; مریم انصاری. "برآورد میزان فرسایش خاک در دشت مرودشت (استان فارس) با استفاده از مدل تجربی RUSLE". پژوهشهای ژئومورفولوژی کمّی, 4, 4, 1397, 134-149. انصاری لاری, احمد, انصاری, مریم. (1397). 'برآورد میزان فرسایش خاک در دشت مرودشت (استان فارس) با استفاده از مدل تجربی RUSLE', پژوهشهای ژئومورفولوژی کمّی, 4(4), pp. 134-149. انصاری لاری, احمد, انصاری, مریم. برآورد میزان فرسایش خاک در دشت مرودشت (استان فارس) با استفاده از مدل تجربی RUSLE. پژوهشهای ژئومورفولوژی کمّی, 1397; 4(4): 134-149. فرسایش خاک، نه‌تنها سبب فقیر شدن خاک و متروک شدن مزارع می‌گردد و از این راه، خسارت‌های جبران‌ناپذیری بر جای می­گذارد؛ بلکه با رسوب‌گذاری در آبراهه‌ها، مخازن سدها و بنادر و کاهش ظرفیت آبگیری آن‌ها، زیان­های فراوانی را موجب می‌گردد. پیش‌بینی فرسایش خاک ، همواره یکی از متداول­ترین روش‌ها در مدیریت منابع طبیعی به جهت کنترل بهره‌وری خاک در داخل حوضه و تخمین میزان رسوب و کیفیت آب در خارج از حوضه است. در این پژوهش به بررسی میزان فرسایش خاک دشت مرودشت با استفاده از مدل تجَربی RUSLE در محیط (GIS) که شامل عامل فرسایندگی باران، عامل فرسایش‌پذیری خاک، عامل توپوگرافی و پوشش گیاهی می‌باشد، پرداخته‌شده است. در این تحقیق از اسناد و مدارک مختلف ازجمله نقشه‌های1:50000 توپوگرافی،1:100000 زمین‌شناسی،خاک­شناسی، کاربری اراضی، پوشش گیاهی، آمارهای مختلف مربوط به ایستگاه‌های باران‌سنجی و مدل ارتفاعی رقومی (DEM) به‌عنوان ابزار تحقیق مورداستفاده قرار گرفت. بررسی نقشه خطر فرسایش خاک‌ نشان می‌دهد که میزان خطر فرسایش خاک در سطح دشت از صفر تا 50 برحسب تن در هکتار در سال متغیر است. مطابق با این نقشه، بیش‌ترین قسمت منطقه موردمطالعه، جزء طبقه فرسایشی خیلی کم تا کم قرار داشت که به‌طور عمده‌این کلاس‌ها در مرکز دشت واقع‌شده بودند. بیش‌ترین مناطق تحت خطر فرسایش بالا تا شدید، در مناطق با شیب زیاد دشت قرار داشتند. All living organisms on the planet and the integration of world civilization is soil. Soil erosion not only caused poor soil and desolate farms and in this way, leaves irreparable damages, but also causes enormous harms by sedimentation in streams and rivers, dam reservoirs and ports and reduce their intake capacity. Prediction of soil erosion, is always one of the most common methods in the management of natural resources inside basin for controlling of soil productivity and estimate the amount of sediment and water quality outside the basin. Nearly 40 percent of the area in Iran is semi-arid region, In these areas, soil erosion is more than other areas because of inappropriate distribution of precipitation during the year and weakness vegetation, therefore, controlling soil erosion action is important in these areas, particularly in the agricultural lands. In this study, the amount of soil erosion has been studied in Marvdasht plain. For this, the Revised Universal Soil Loss Equation (RUSLE) model has been adopted in Geographic Information System (GIS) technique framework that include The R, K, LS, C, and P factors. Marvdasht plain is located in the south-west of Iran, Fars with an area about 3,600 square. 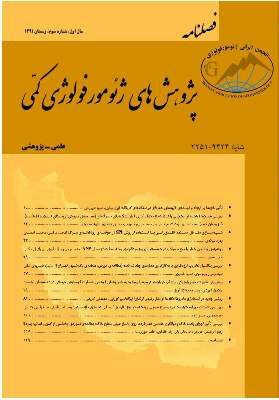 To achieve the target, have been used Of various documents, such as topographic maps with the scale of 1: 50,000 including sheets Marvdasht I6549, Farough IV6649, Zarghan IV6549, Koushkak III6550, Sivand II6550, Saadat Shahr III6550,Dareyoun II6549, Rahmat Abad III6649 and Shiraz III6549 For analysis of topography, check slope and hydrographic network, elevation and quantitative analysis; geological maps of Shiraz and Sivand with a scale of 1: 100,000 for the stratigraphy, lithology, the nature of materials, geological structure, development stages and etc; soil map, Land use/land cover map, Vegetation map, monthly and annual precipitation data and Digital Elevation Model (DEM). In this study, RUSLE models in GIS environment has been used for estimate the amount of soil loss Marvdasht Plain Which shows Marvdasht Plain has highly variable topography. This determined with the range of zero to 5/51 of LS factor, the maps show Rain Erosion (R) factor is variable in the basin from 11.5693 to 75.3634 MJ mm ha, The erosion in the northeast is lower than the Southwest of basin. To prepare the C factor map were used land use and vegetation maps this factor is variable From 0.02 to 0.99 that represents a good vegetation in basin, more soil of the area has been formed of the Quaternary alluvial sediments which are composed of Quaternary sediments Include clay and silt and salt and sand that most extend in Central of Plain. Evaluation of soil erosion risk map shows that amount of risk soil erosion is variable in the plain from 0 to 50 in tons per hectare per year. According to this map, the most part studied area was in the very low until low class (98%) Which mainly these classes were located in the center of the plain. About 0.5 percent of Marvdasht Plain was located under high erosion risk until extreme. Among these, the most high until extreme erosion risk areas were located in areas with high gradients in plain.